What's The Difference Between A Canopy Tour And A Zip Line? BlogWhat’s The Difference Between A Canopy Tour And A Zip Line? – Tell me about The Summit’s canopy tours and zip lines? Maybe I’m the only one in this category, but I didn’t know much about canopy tours when I first got involved in developing the program for the Summit. I know a lot more now! On the off chance there may be others out there that are new to the subject I thought I’d focus this week’s blog on canopy tours. As I searched for information on canopy tours in the U.S., I discovered that, in most cases, sites with canopy tours also had free standing zip lines. The same will be true at the Summit. Canopy tours tend to be measured in terms of hours on tour, zip lines in terms of length. 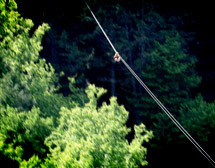 The most extreme U.S. zip line I found was 3300 feet long. The longest canopy tour was 5.5 hours. The Summit will be able to hold its own in both categories. We will have 5 zip lines that are over 3500 feet in length. We will also have 10 shorter zip lines of about 1200 feet in length. In the case of canopy tours, the Summit will have 8 courses, 4 of which will be 3.5-hour tours and 4 of which will be 2-hour tours. No matter how you measure it, the Summit will be among the top zip and canopy tour sites in the U.S. when we open for the 2013 National Jamboree. Come soar at the Summit. There’s still time to register for the jamboree at www.BSAJamboree.org.